Daniel Westley has been on so many podiums you’d think he’d been playing sports all his life. In fact, he had barely shown any interest in athletics until after a tragic accident forced doctors to amputate both of his legs. While in the hospital, Westley happened to meet a young Rick Hansen who, years before raising millions for spinal cord injury research, introduced Westley to wheelchair athletics. Westley was hooked. 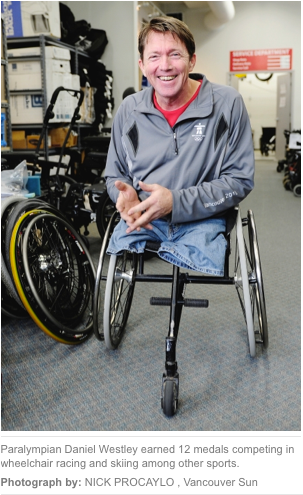 After being released from the hospital he started playing sports as much as possible, earning his spot in the 1988 Paralympic Games in Seoul, South Korea. “I happened to get involved in 1988 and at that time they embraced disabled sports.” recalls Westley, who lives in New Westminster. But as the Paralympic Games grew in size and popularity, so too did the pressure of training and competing on the world stage. Westley was now participating in both the summer and winter games in a wide range of sports that included everything from wheelchair racing to skiing. To perform at the highest level, Westley relied on Transcendental Meditation, a technique that involves two 15- to 20-minute sessions each day and promises a clear and quiet calmness for its practitioners. With his meditation keeping him centred, Westley certainly did do well, going on to win 12 Paralympic medals – four of which were gold medals – in five Paralympic Games. And yet, for Westley, who now works in sales for a home medical equipment company, the positive influence of meditation extended far beyond sports and has helped him sustain a positive attitude in all facets of his life. See the excellent accompanying Sun video report: story.html?tab=VID. Empowered Health airs Thursdays on CJDC at 11 a.m.; CHEK-TV Vancouver and Victoria, CFJC and CKPG at 7 p.m. and CHAT at 7:30 p.m. The show is broadcast Tuesdays on CFTK at 11:30 a.m. You can also view episodes online at vancouversun.com/empoweredhealth. Related: Watch this inspiring Chek TV program: North of 49: A guide to the rest of your life: Former paralympian Daniel Westley talks about achieving balance in your life as you head North of 49 from Season 2, Episode 1. This entry was posted on April 5, 2012 at 12:08 am and is filed under Articles, Health, Sports. You can follow any responses to this entry through the RSS 2.0 feed. You can leave a response, or trackback from your own site. Very inspiring! Thanks a lot.